Titanium (Ti) (atomic number 22 and atomic weight 47.90) has density of 4.52 gm/cc. Melting point of Ti is 1660 deg C and boiling point is 3287 deg C. Ti is a highly active element. It usually forms a stable oxide coating at room temperature on its surface, which limits further oxidation. 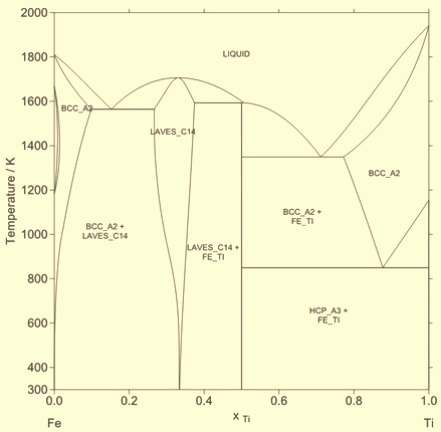 The phase diagram of the Fe (iron)-Ti binary system is at Fig 1. Ti forms stable compounds with oxygen (O), carbon (C), nitrogen (N) and sulfur (S) at temperatures of steelmaking. It is sometimes used in steelmaking because of its property for fixing of these elements in order to reduce their harmful effects. Ti is also used for the purpose of grain refining in many steels. In many respects, functions of Ti are similar to the addition of both aluminum (Al) and niobium (Nb). Ti is more expensive than Al; hence it is rarely used as a deoxidizer. The reactivity of Ti is similar to that of magnesium (Mg) and it can quite easily be set on fire. It burns with a bright white flame, which can be harmful to look at. Ferrotitanium powder is also flammable, with the powder having finer size and higher Ti content being more hazardous. Ti ores are mainly ilmenite (FeO.TiO2) and rutile (TiO2). Ti containing addition agents are Ti metal scrap, ferroalloys and master alloys. Ti metal scrap may be of commercial purity Ti. Ti metal scrap is of two types one with 6 % Al and 4 % vanadium (V) while the second with 6 % Al, 2 % tin (Sn), 4 % zirconium (Zr), and 2 % molybdenum (Mo). Sn is usually an unwanted element in steels. Since the melting point of Ti is higher than that of the liquid steel hence it generally enters the steel by dissolution, rather than melting. Also due to the low density of Ti, it is to be forced into the liquid steel to avoid its oxidation and consequently it has a low recovery. Ferrotitanium (Fe-Ti) is a ferro alloy of Ti and is available in many grades, but the most common grades contain either 10 % to 20 % Ti or 45 % to 75 % Ti. Fe-Ti may contain a small amount of C. Since the main use of Ti is as a cleansing agent for S, C, O and N, hence Fe-Ti with the lowest possible content of these elements is preferred for steel making. Other impurity elements in Fe-Ti can be chromium (Cr), Ni, Zr and Cu. Proprietary alloys will contain titanium plus additional elements such as Al, Zr, Cr, or silicon (Si). They are not commonly used as Ti additions per se, but rather for a combination effect, such as sulfide shape control or increased yield strength. In some cases, they are added simply as a protection mechanism for boron (B), which would otherwise be lost from the liquid steel by its reaction with N or O. There has been a trend towards the use of cored wire for the addition of Fe-Ti. Fe-Ti (70 % Ti) of size 2 mm or finer is encapsulated inside a sheath of mild steel, wound onto a coil. By this method, Fe-Ti can be added continuously to a liquid steel bath, launder or tundish. The steel sheath protects the ferroalloy from oxidation. The fine size of the ferroalloy ensures quick and high recovery of Ti. Fe-Ti with 70 % Ti 30 % Fe falls at the eutectic point of the system, with a melting point of 1085 deg C. It is known as eutectic Fe-Ti. As this is well below steelmaking temperatures, the ferroalloy melts, which is far quicker than the dissolution required for metallic Ti to enter the steel. It is for this reason that eutectic Fe-Ti is the preferred analysis for use in steelmaking. Since Ti oxidizes easily, it is necessary that care is taken during additions. In case precautions are not taken during additions then the Ti recoveries are reduced drastically. Hence all efforts are needed to avoid contact between the Ti addition and air or oxidizing slag. Ti additions are typically made in the ladle as scrap or lump during tapping, as cored wire into the ladle, or as lump during secondary steel making processes. The liquid steel should be thoroughly deoxidized first, usually with a prior addition of Al. Normally it is preferred to add the Ti late in the tapping, when the ladle is half to three fourth full and after all other additions except B. The purpose is to leave as little time as possible for reoxidation of the steel to occur, since the Ti takes up any leftover O, thereby reducing its effectiveness. Also contact with oxidizing slag need to be avoided, since the slag/Ti reaction is detrimental to the Ti recovery and the coating action of slag impedes the rapid melting and dispersion of the Fe-Ti in the liquid steel. When additions are necessary in the steel making furnace then Ti is to be added only after thorough deoxidation and just before the tapping. A thin layer of reducing slag helps preventing reoxidation and acting as a barrier as well. Ti recoveries are usually lower than those for most of other additives. Recovery normally varies in the range of 50 % and 90 % depending on the practice of the steelmaking practice and the type of additive used. Fe-Ti usually gives more recovery than scrap because of its higher density (less likely to float on the liquid steel surface and oxidize) and its lower melting temperature. Hence Fe-Ti is normally the preferred addition agent. Rolling of steels having Ti is fairly straightforward and follows, in general, the pattern established for other controlled rolled products. Titanium nitride (TiN), formed while the steel is still liquid, is carried over into the rolled product thus, changes in soaking temperature has little effect unless niobium (Nb) is also present in the steel. Most of the strengthening imparted by Ti is due to the precipitation of titanium carbonitrides [TiC(N)] while the grain refinement has lower contribution. Hence steels with Ti have poorer impact resistance than steels having other micro alloying elements unless extra precaution is taken to ensure very fine possible grain size in the rolled steels. Lowering the finishing temperature to about 840 deg C has a beneficial effect on impact transition temperature. For higher strength products (YS above 550 MPa), coiling temperatures in hot strip mills are to be kept below 650 deg C.
Sulphides present in steels tend to become elongated during hot rolling. This leads to poor impact properties and reduced ductility. Elongation of sulphides can be harmful in welded structures. Ti controls the sulphide morphology since it allows them to retain a less harmful globular shape throughout the hot rolling process. The effects of Ti on heat treatment and microstructure are directly related to its reactivity mainly with respect to C. Hence pearlitic Ti bearing steels contains less cementite (less pearlite) because any Ti not already combined with C or N forms the highly stable carbide (TiC). C scavenged in this manner is about 0.25 % of the available Ti. This means that pearlite is completely absent in steels containing Ti which is equal to more than four times the C content. There are no complex carbides of Fe and Ti. Ti increases the grain coarsening temperature. In this respect it is much more effective than Al when concentrations of either element exceed 0.035 %. However, steel containing 0.03 % Al and 0.005 % Ti has a grain coarsening temperature which is higher by around 30 deg C.
There is a complex effect of Ti on hardenability. Hardenability normally decreases with the increase in the Ti concentration unless austenitizing temperatures are raised. This is due to the formation of TiC which lowers the C concentration in austenite. Further, Ti refines the grain size, and this decreases hardenability all the more. If only acid soluble (uncombined) Ti is considered, its hardenability factor is about the same as that for Mo. Ti steels also exhibit secondary hardening upon tempering due to the precipitation of TiC. The effect is increased when austenitizing temperatures are above 980 deg C.
The main use of Ti as an alloying element in stainless steel is for carbide stabilization. It combines with C to form Ti C which is quite stable and hard to dissolve in steel, this tends to minimize the occurrence of inter-granular corrosion when adding approximately 0.25 % -0.60 % Ti. The C combines with the Ti in preference to Cr, preventing a tie up of corrosion resisting Cr as inter-granular carbides and the accompanying loss of corrosion resistance at the grain boundaries. Ti is used in stainless steels and it has a role of a carbide stabilizer. Austenitic grade of Type 321 contains Ti which is equal to at least five times that of the C content in order to prevent the precipitation of Cr carbides on grain boundaries during extended holding at higher temperatures. Without the presence of Ti, Cr gets depleted at grain boundaries, leading to inter granular corrosion. The carbide fixing properties of Ti are also valuable in ferritic grade stainless steel Type 409 stainless steel. This steel is widely used in the manufacture of automotive catalytic converters and other exhaust components. Low strength, highly formable interstitial free (IF) steels are used for auto body pressings of complex geometry and for tinplate beverage cans. Ti is added at typically ten times the C content of the steel, to form TiC and TiN, so freeing the steel of dissolved C and N.
High strength low alloy (HSLA) steels rely on a combination of precipitation of carbides and nitrides, and grain refining for their strengthening mechanism. Though Nb and V are the main micro alloying elements for this, yet Ti is also used, especially for the precipitation of [TiC(N)], following controlled rolling and rapid cooling. [TiC(N)] is the only micro alloyed carbonitride which is stable at the high temperatures attained in the HAZ (heat affected zone) during welding, where it reduces grain growth and increases toughness. Ti also forms its nitride at very high temperatures and is therefore used to reduce grain growth of austenite during hot rolling of plates. Ti is used to protect B in steels for hardenability. Ti is added before B, to tie up any O and N in order to improve the effectiveness of the B addition. In low alloy steels which have been grain refined with Al, aluminum nitride (AlN) may be the cause of inter granular fracture which is known as ‘panel cracking’. An addition of Ti causes TiN to be precipitated uniformly in the matrix and increases ductility. A Ti content of 0.05 % is typical for this application. The precipitation of Ti inter metallic compounds is one of the principal strengthening mechanisms in maraging steels, which may attain yield strengths in excess of 3450 MPa. Ti is occasionally used in tool steels, which it can make less susceptible to quench cracking. Because of their reduced air-hardening tendencies, such steels will develop tougher core structures. For enameling steels an addition of typically 0.15 % Ti is needed to control the surface roughness for allowing a good, even coating of enamel.